A survey of several hundred biomedical scientists working in Belgium suggests research misconduct is prevalent in both academic and industrial circles, with around two-thirds of respondents admitting to at least one of a list of dubious practices over the past three years. Ethics researchers at KU Leuven sent the anonymous email survey to 2000 academics and industry biomedics, who were asked whether they had committed or witnessed any of 22 kinds of misconduct. The list included actions such as fabricating data, plagiarism, cutting corners, ignoring specific safety or regulatory requirements and changing the results of a study in response to pressure from funders. They received 617 responses from universities and 100 from industry. 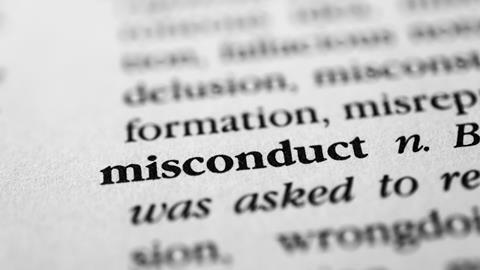 Statistical analysis of the responses showed those within universities were more likely to self-report misconduct than those in industry, with 71% of academic respondents admitting to at least one act of misconduct compared with 61% for industry. Likewise, 93% of university respondents said they had observed misconduct among colleagues, compared with 84% of respondents from industry. There were, however, few significant differences between the two when it came to specific types of misconduct. The figures are signficantly higher than another anonymous survey reported. The researchers who conducted the survey say the results suggest research misconduct occurs ‘to a substantial degree’ both in industry and academia.